Today Apple announced revised plans for its 2.8 million square foot headquarters building. If you haven’t seen it, it’s shaped like a giant spaceship doughnut, one that will hold 12,000 employees. 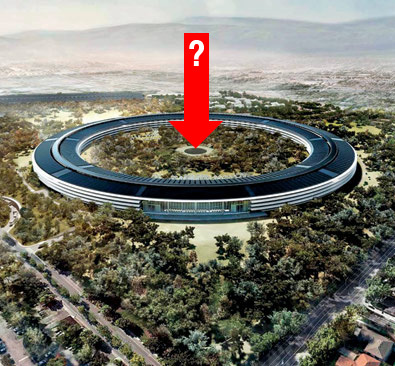 What will be at the very exact center of this circular campus? From the renderings it looks to be just an open field of grass. I hope some Apple employee sneaks some small marker where the exact center is. Maybe a little toothpick flag or something more symbolic.